Make sure to reactivate your status as a voter if you have moved! In fact, it is just a good idea to log on to myvote.wa.gov and check your voting status now. WA state and your county are actively paring (or making inactive) voters who have moved, passed on, not submitted change of address forms in preparation for the October/November general election period. When I perform the PostgreSQL query below on the September 5 vs. the September 19 active voter databases in Whatcom County, I have a possibility of 3589 to 3693 voters that are no longer part of the current active voter database. If you have any doubts that the current registration process isn't a disaster for urban millennials, check out the stats below. Code for this post is here. The answer is that solitary checkbox, the Five Eyes Defeat. One checkbox is what separates our most sacred rights from the graveyard of lost liberty. When an officer of the government wants to know everything about everyone in their society, they don’t even have to make a technical change. They simply uncheck the box. The question before us is no longer “why was this done without the consent and debate of the people of this country,” but “what are we going to do about it?" "I would like to see *grand city projects* in the urban core and surrounding city like light electric rail to BC, a bridge over the rail to the waterfront from Broadway, downtown skyscrapers, high tech business parks off Hannegan, a brilliant, utilitarian but classic new library with meeting rooms and skybending architecture, a world class concert hall on the Waterfront, a wealthy enriched population engaged in mathematical and scientific research." I think this survey is probably a misuse of sampling technique that will add little that is important to discussions about growth in Bellingham. The internet could be used so much more thoroughly than a limited, handpicked sample of multi-choice opinion questions. What cities should host are forums and mail lists about growth in a specific area to encourage communities to have lively discussions with frequent moderation and contributions by COB planners and Council members. Cities could develop online simulations of growth areas and development, allowing users to construct and design buildings and city amenities in their cloud space for competition or display of the most interesting designs. Providing software that simulated the effect of growth on co-factors like traffic, accidents, air quality, park space,wildlife, child care, bicycle and pedestrian safety, crime, jobs would allow citizens to think about the impacts of their design decisions as our city grows increasingly complicated. A survey monkey is a cute idea, but what is really needed is something like a "Second Life meets Sim City meets Urban Big Data" with real live politicians, planners,economists, environmentalists of note invited/mandated to play the game with community members who can contribute their own visions of urban development. Like corporate world policy and shareholder meetings, web conferencing and q and a could be provided by city planners in the late evening hours via services like "Live Meeting" so that citizens could listen in live and send in opinions without leaving the comfort of their homes. I don't think urban centers have figured out a way to engage their populations with all the communication tools available to them on the internet. Maybe if they did, they could use these tools to their advantage to encourage lots of participation from many different users. My guess is the first city to do this will find a way to increase civic pride and decrease civic resistance. To top it all off, nothing seemed to prevent me from taking the survey over again which doesn't make this a very reliable poll. Any way I found the survey at this link. 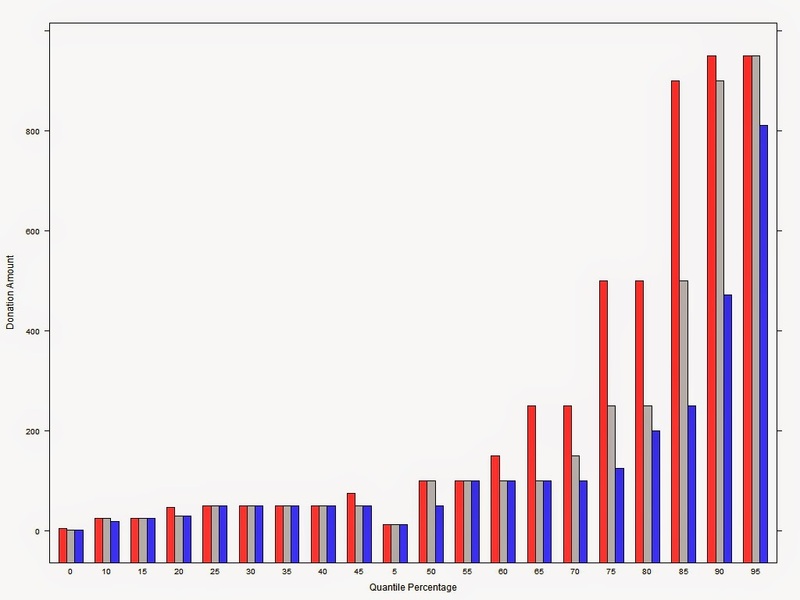 Above is a quantile plot of Republican (red) vs. Democrat (blue) campaign donations for the six candidates in the 2014 WA LD 42 races as of 09/01/2014. Quantile plot for all donation levels are in gray. The extensive difference between the 60th to 90th percentiles corresponds roughly to the $200 - $850 donation levels; a difference which has allowed the Republicans to raise more funds than the Democrats by $96K ($324K - $228K), despite the fact that the Democrats have 368 more unique contributors (1157 -789). A total count of contributions favor the Democrats as well 1512 to 1160, revealing a large number contributors who have donated to multiple campaigns.